I haven’t done one of these kinds of posts in a while, but this post by sartorias has me thinking again about things in my room/house. One of the good things about getting older is that you get less sentimental about things that you once thought were important. One of the bad things about getting older is that you get more sentimental about things you never thought were important. In my own defense, I have managed to purge three large black bags of trash in the last couple of weeks, with another half bag waiting to be topped off. So, I am making progress. If you walked into my house you might not see that progress because most of the purging has been in two abomination rooms where I shoved junk to get it out of the way when company came. I am not proud of this behavior—and definitely paying the wages of that sin now—but I am moving on to it. Someday the decisions may be harder as I get away from pure clutter trash to somewhat more meaningful trash. I have gotten rid of some of that, too, either through donations or—gasp!—throwing away. Some of these decisions were made easier by the rat apocalypse that happened in this house the year after my mother died. I won’t say I’m grateful for the rat input, because I’m not, but some things were no longer redeemable. And the rats are finally gone after I did away with humane trapping and went medieval on them (after them destroying one appliance until it was unrepairable and having monthly visits of repair persons for about nine months straight). 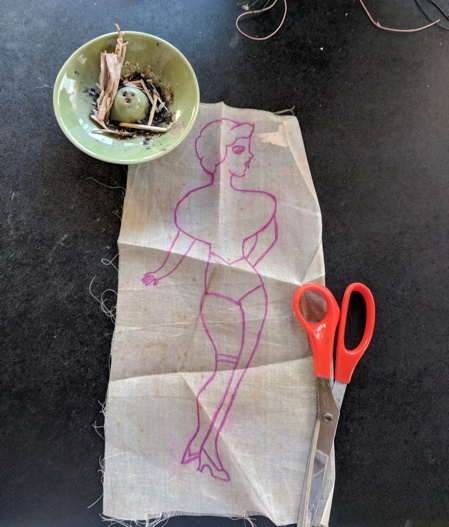 In my trash sorting, I came across some patterns my mother had used to make countless craft aprons in the sixties and seventies, with the posh and retro lady shown above. On the aprons, she wore a tailored bodice, a skirt that flared out and could be lifted to show her matching underwear. The garter belt around her leg bore a sparkling rhinestone in the middle. Mom sold quite a few of them over the years through her work and friends of friends. They were exquisitely made—because my mother was a fine seamstress—and hand-painted with fabric paint. Cute, kitschy things. Maybe someone who is into retro might want to make them again. But not me. I am not the seamstress my mother was, for one. For another, this was my mother’s thing, not mine. I thought I was strong. “I won’t ever use these patterns. I can throw them away for the sake of my sanity.” Not two hours later I fished them out of the trash bag. My mother drew these with her own hand, used them countless times. They had her imprint all over them. I just couldn’t do it. A friend suggested framing them and hanging them on the wall of my own crafting space. I thought that was an excellent compromise. Here you see the pattern Mom used to cut out the material for the lady’s skirt, bodice, and knickers. These were redrawn in a kind of shorthand after the original patterns disintegrated. Mom had done so many of these she didn’t really need a pattern, but it was a security blanket for her, and if they weren’t precise, well, her artistry made them fit. 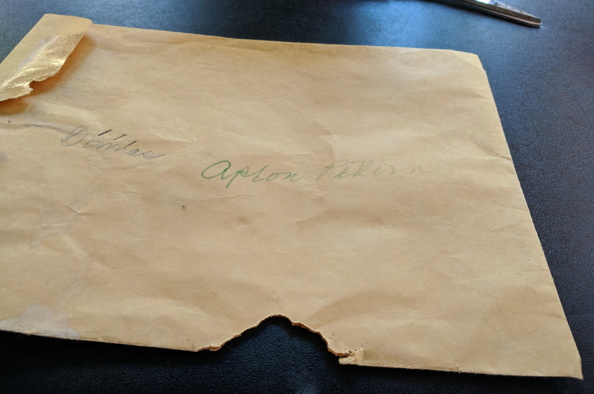 I didn’t even have the heart to throw out the old envelope they were in because it had my mother’s handwriting on it, “Donna’s apron pattern.” You can see on the lower edge where the rats chewed it. Miraculously, they didn’t manage to damage any of the patterns. Me Virgo, she Aries. These graphics are so not my style, not what I want on my wall. 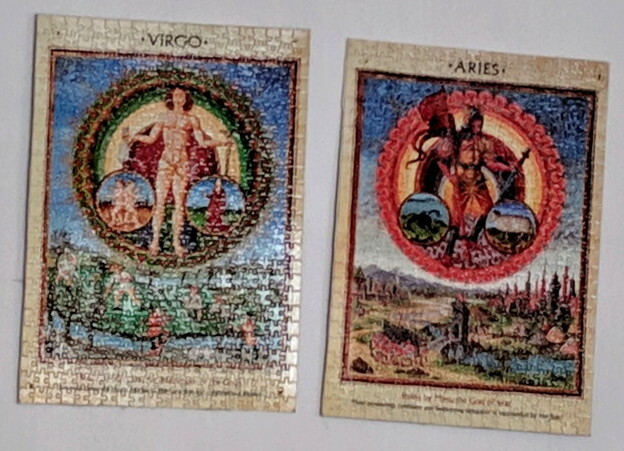 But my mother put these puzzles together with her own hand, glued them to cardboard backing, and hung them on her wall. I cannot for the life of me consign them to the trash barrel. I can and will take them down from the wall, but they are also going into the closet. Let whoever gets this house and doesn’t understand the sentimental attachment get rid of them. I will do my best to clean out as much trash as possible, but some trash isn’t real trash. At least not to me. Whoever winds up clearing out this property will just have to deal with that. You are currently browsing the archives for the attachment	category.